The Conquest of Everest – 1953 style : amazing video. This incredible documentary of the 1953 summit brings home what they accomplished when compared to today’s climbs. The images and film sequences are quite remarkable for the day. From the pictures of the June 2, 1953 headline on the Daily Mail “The Crowning Glory – Everest Conquered” to the harsh ground blizzards at the high camps to the South Col scenes are simply amazing given it was 1953. I felt like I was back there. The documentary starts with a brief history of John Hunt organizing the team and logistics. One of many interesting scenes is of the oxygen system testing. They simulated the summit of Everest in a pressure chamber where the climbers themselves served as guinea pigs. One of the research doctors almost passed out as the pressure was reduced very quickly. This probably fueled speculation that humans could not survive on the summit without supplemental O’s. They also tested tent material to withstand high winds, new boot technology and food. However it is the challenge and difficulty that stand out in the film. They took 10 days on the Lhotse face, today it is 1 or 2 at the most. It required 15 tons of gear – all carried by 350 porters from Kathmandu to base camp; no flights to Lukla! 34 Sherpas carried 40lbs each through the Icefall using logs to cross crevasses – no ladders. They established a base camp in the same location used today on April 12, 1953. Today there are 4 camps to the summit, they established 9. The film documents that on May 26, 1953 Tom Bourdillon and Charles Evans reaching the South Summit and returning exhausted. An intriguing moment shows Hillary and Tenzing greeting and taking care of the returning climbers as they prepare to take the baton for the next summit bid. 11.30 a.m. on May 29, 1953; Tensing and Hillary summited. 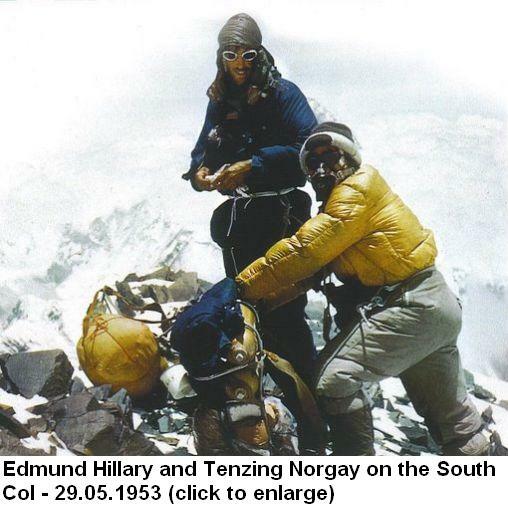 As was the agreement between Tenzing and Hillary, the narrator simply says “Tenzing together with Hillary set his feet on the summit” – no mention of who was first. You can read a bit about the film on IMDB. To see how it is climbed today, don’t forget to watch the Everest: Beyond the Limits on the Discovery Channel. I am sure it will be quite the contrast. * Source : – Alan Arnette : 2010 Everest expeditions.